Blue Origin’s goal of creating an ‘astronaut experience’ for fee-paying members of the public has moved forward with the successful test of New Shepard’s escape system. 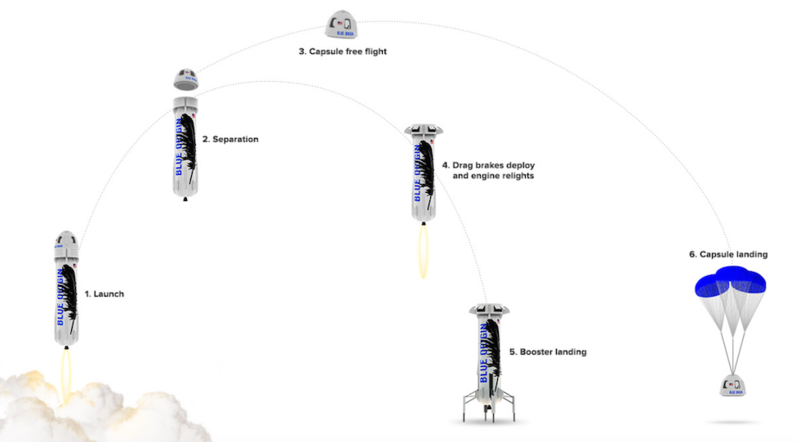 New Shepard is Blue Origin’s reusable vertical take-off, vertical landing spacecraft that consists of a pressurised capsule on top of a booster. Launched from a site in Texas, New Shepard performed an in-flight test of the capsule’s escape system, which is designed to propel the crew to safety if a problem is detected with the booster. Less than a minute into the mission and at an altitude of 4,893m, the capsule separated and the escape motor fired, pushing the capsule away from the booster. Reaching an apogee of 7,092m, the capsule then descended under parachutes. After the capsule escape, the booster continued its ascent, reaching an apogee of 93,713m. At just under eight minutes into the mission, the booster executed a controlled, vertical landing back at the Blue Origin’s West Texas Launch Site, marking the completion of its fifth and final mission. Founded by Amazon founder Jeff Bezos, Blue Origin is developing technologies to enable private human access to space. – and why there was none such arrangement for the Shuttle, which could have rescued/saved at least one of the disaster victim-crews, remains a further mystery. The crew quarters being virtually a separate compartment to the front. The lack of safety of the space shuttle astronauts in the event of catastrophic problems is inexcusable. However we should perhaps bear in mind that the design originated in the early 70’s after initial research going back at least a further decade. We’ve come a long way during the intervening 50 odd years, both in technology and approach. I know a test pilot who was active from the 60’s through to the start of this century and he was told me that he assumed at the outset that he wouldn’t see his 40th birthday!